Two young Americans with their eyes on quarterfinal berths at the 2015 BB&T Atlanta Open took to Stadium Court to start the day with air temperatures at 95 degrees and a heat index of 101. No. 3 seed Jack Sock and Denis Kudla weren’t going to let steamy temperatures get in the way of some high quality tennis. Sock, in the middle of his best season on the ATP World Tour jumped on the maryland native with a break in the fifth game of the opening set. Kudla, who held a 1-0 career mark over Sock coming into the match wasn’t deterred and broke back to level the set and saved three break points late in the set to force a tiebreak. An evenly played tiebreaker was knotted at 6-6 when Kudla chased down a short drop shot to pull ahead and ultimately close out the set. Sock’s face immediately reflected all the break chances he failed to convert. Sock, appearing to feel the heat more than Kudla was broken early in the second set. Kudla consolidated the break and pulled out the 7-6 (6) 6-3 victory. Kudla was asked if playing three matches this week helped him as this was Sock’s first singles match. The second match of the day on Stadium features two players who arrived in Atlanta a few days early. Steve Johnson to get used to the heat and humidity and Ricardas Berankis to play the qualifying draw. In this first meeting of these two players, it was Berankis who jumped out with an early break. While Johnson broke back, it was the Lithuanian who was more consistent from the baseline and he handled Johnson’s serve with relative ease. Berankis added another break to take the opened 6-4. A brief rain delay hit the grounds of Atlantic Station in between sets, but the cool sprinkles didn’t cool off the hot Berankis. 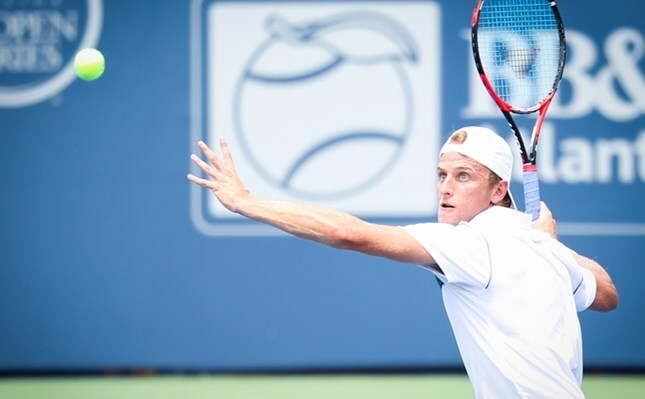 The qualifier, whose best result in 2015 was a quarterfinal showing in Zagreb frustrated Johnson with his return of serve, while The former USC Trojan appeared to be thinking ahead to his next event in Washington D.C. Berankis closed out the second set 6-2. In the one second round match on the AJC Grandstand Court, 2014 singles finalist, Dudi Sela of Israel earned his eighth win of 2015 as he defeated Benjamin Becker of Germany 7-5 6-3. This was a rematch of their 2014 semifinal here in Atlanta that Sela won in three sets.